There are several chinch bugs that attack turfgrasses in North America. The hairy chinch bug, Blissus leucopterus hirtus Montandon, is the most commonly encountered pest of northern turfgrasses though the common chinch bug, Blissus leucopterus leucopterus Say, is occasionally found. These closely related pests are very difficult to separate in the field and most people identify them by locality and their host plant. The common chinch bug is normally found from South Dakota across to Virginia and south to a line running from mid-Texas across to mid-Georgia. The hairy chinch bug cohabits some of the northern range of the common chinch bug but also extends throughout the northeastern states and into southern Canada. There are also southern and western chinch bugs that persist where their name suggests. The hairy chinch bug prefers turfgrass species such as Kentucky bluegrass, fescues, perennial ryegrass, bentgrass, and zoysiagrass. The common chinch bug prefers grain crops such as sorghum, corn, and wheat but will attack turfgrasses such as Bermudagrass, fescues, Kentucky bluegrass, perennial ryegrass, zoysiagrass, and crabgrass. Chinch bug damage is usually first detected when irregular patches of turf begin to turn yellow then brown. The patches continue to expand outward and the turf eventually dies, regardless of irrigation. Chinch bug feeding may resemble drought stress, other insect damage, or turf diseases. Damage generally occurs during hot, dry weather from June into September. As a chinch bug feeds with its piercing-sucking mouthparts, it secretes an anticoagulant into the host plant. This clogs the vascular tissues within the turf causing it to turn a purplish tint. By blocking the water, the leaves wither as in drought and the manufactured food doesn't get to the roots. The result is plant death. These pests are true bugs and have a gradual life cycle, or incomplete metamorphosis, with egg, nymphal, and adult stages. All the species of Blissus are very similar in form and an expert is needed to separate species and subspecies. The eggs are elongate, bean-shaped, approximately 0.84 mm long by 0.25 mm wide, and are roundly pointed at one end and blunt at the other. The blunt end has several small tubercles visible through a dissecting microscope. The eggs are first white and change to bright orange just before emerging. There are five nymphal instars, which change considerably in color and markings with each successive molt or instar. The first instar has a bright orange abdomen with a cream colored stripe across it, a brown head and thorax and is about 0.9 mm long. The second through fourth instars continue to have this same general color pattern except that the orange color on the abdomen gradually changes to a purple-gray with two black spots. The fourth instar increases to more than 2 mm long. The fifth instar is very different because the wing pads are easily visible and the general color is now black. The abdomen is blue-black with some darker black spots and the total body length is about 3 mm. The adults are approximately 3.5 mm long and 0.75 mm wide. The males are usually slightly smaller than the females. The head, pronotum, and abdomen are gray-black in color and covered with fine hairs. The wings are white with a black spot (the corium) located in the middle of the front-wing edge. The legs often have a dark burnt orange tint. Adults may be brachypterous (short-winged) or macropterous (full-winged), however, only the macropterous adults are able to fly. The hairy chinch bug adults overwinter in the thatch and bases of grass stems in the turf, as well as tall-bunch type turf. The common chinch bug prefers to move to tall, bunch-grasses in open fields to find overwintering sites. These individuals then migrate in search of grain crops in the spring but may establish in turf instead. The adults of both species become active when the daytime temperatures reach 70 degrees F. The females feed for a short period of time and mate when males are encountered. Eventually the females begin to lay eggs by inserting them into the folds of grass blades or into the thatch. It has been suggested that each female undergoes two oviposition events during each generation. This usually occurs from mid-April into June, from New York to Illinois. A single female may lay up to 200 eggs over 60–80 days. The eggs take about 20–30 days to hatch at temperatures below 70 degrees F but can hatch in as little as a week when above 80 degrees F. The young nymphs begin to feed by inserting their mouthparts in grass stems, usually while under a leaf sheath. The nymphs grow slowly at the beginning of the season because of cool temperatures but development is accelerated with the onset of warmer temperatures. Usually the first generation matures by mid-July. At this time considerable numbers of adults and larger nymphs can be seen walking about on sidewalks or crawling up the sides of light colored buildings. If a good, hot, dry spring is available, turf injury by the first generation can be evident by June. Damage may be visible from late-June through August when the spring generation mature nymphs and adults are feeding and the second generation of nymphs is becoming active. During the hot summer months, the new females lay eggs rapidly and their young may mature by the end of August into September. The second generation adults may lay a few eggs for a partial third generation if the season has been long. However, most of these late nymphs do not mature before winter temperatures drop. When cool temperatures arrive, the mature chinch bugs seek out protected areas to spend the winter. Life stages of the hairy chinch bug: egg, five nymphal instars, and winged adult. Chinch bugs are some of the oldest known insect pests native to North America. The first records of damage to crops are from the 1780s. Because chinch bugs are major crop pests, a large number of control strategies have been suggested. Since most of these control strategies have been used against the common chinch bug in field crop protection, only those useful for management of the hairy chinch bug in turfgrasses have been selected. Chinch bugs are relatively easy to control if they are detected early (see "Sampling" below). It used to be recommended that regular irrigation would increase the attack of the white fungus disease of insects, Beauveria bassiana, but recent research suggests that this disease has a greater impact on the chinch bugs when the turf enters into summer dormancy. So, allowing the turf to go into summer dormancy during hot and dry weather should decrease hairy chinch bug populations. The hairy chinch bug seems to prefer Kentucky bluegrass, perennial ryegrasses, and fine fescues. Lawns with 50 percent or more bluegrass are the most likely to be attacked. In general, perennial ryegrasses, fine fescues, and tall fescues with endophytes are highly resistant to this pest. Lawns damaged by chinch bugs should be reseeded with endophytic turf. Slightly damaged turf will recover rather quickly if lightly fertilized and watered regularly. Heavily infested lawns may have significant plant mortality because of the toxic effect of chinch bug saliva and overseeding will be necessary. Unfortunately, this often occurs when summer germinating weeds, especially crabgrass, are most active. Thus, additional controls for weeds may be necessary to reduce establishment of these undesirable plants. Do not overfertilize as the lush turf will only attract more chinch bugs into the area. Several commercial formulations of Beauveria bassiana are available; however, studies have shown that applications of this fungus will not reduce hairy chinch bug populations to below damaging levels. 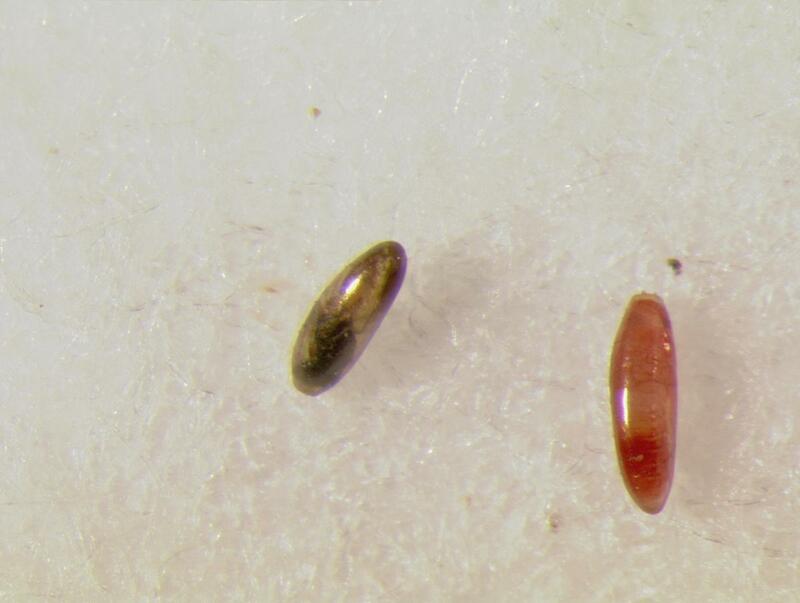 An egg parasitoid (Eumicrosoma beneficum) is known but does not seem to build up populations rapidly enough to control this pest. Several predators, especially the bigeyed bugs, Geocoris spp., are noted to kill large numbers of chinch bugs. Bigeyed bugs are often mistaken for chinch bugs because of their similarity in size and shape. Bigeyed bugs usually do not build up large populations until considerable turf damage has already occurred. In turf areas where chinch bugs have been a perennial problem, early insecticide sprays have been used to reduce the beginning spring population. This works well if applications are made in April or early May to early June, after the adults have finished spring migrations and the young nymphs are just becoming active. Chinch bugs are rather easy to detect in turf and targeted insecticide applications can be applied to reduce populations that appear to be increasing to damaging levels. Several sampling schemes have been developed for determining chinch bug populations in turf. The simplest method is to use the hand and knees technique (visually examine the turf by spreading the canopy and examining the thatch). Chinch bug nymphs tend to hide in the deeper thatch and careful inspection is necessary. Unfortunately, eggs and small chinch bugs are easily missed using this technique. A more reliable method is to use the flotation technique, counting the number of adults and nymphs present over a 10 minute span. To use the flotation technique, cut the top lid out and the bottom lid and rim off a one gallon can. Twist the sharp edge of the can through the turf into the underlying soil. Fill the can with water. Refill if the water soaks into the ground before the 10 minute period. Populations of 25–30 individuals per square foot warrant control, especially if these numbers are encountered in June and July. More complicated sampling methods use repeated sampling over a long period of time, relating the population numbers to temperature and humidity parameters in order to predict future populations. Most insecticides, when applied in liquid form, should not be watered in for chinch bug control, especially with high volume (greater than 3–5 gal/1000 ft2) spray equipment. This is because the chinch bugs are surface and thatch residents. Watering in might wash the insecticide into the soil without challenging the surface insects. Some of the granulars require some irrigation in order to activate the insecticide (release it from the granule). Be sure to check the instructions for current information on post-treatment irrigation. Pyrethroid insecticides labeled for chinch bug control have provided the fastest knock-down of active populations (three to five days), but most of the neonicotinoid insecticides result in satisfactory control within seven to ten days.